Nadine’s (Hailee Steinfeld) life gets a lot more complicated and frustrating when her best friend Krista (Haley Lu Richardson) starts dating her older brother Darian (Blake Jenner). The Edge of Seventeen is a sweet and funny coming of age drama. Nadine is such a flawed and frustrating yet sympathetic character. She is quite self-centred, thinking that she is the only one who has any problems in their life, yet she’s still a teenager who fears she’s losing her one and only friend to her cooler brother. You get where she’s coming from even if the way she deals with it sometimes is incredibly cringe-worthy – I definitely got some second-hand embarrassment from this film but this made Nadine feel more real and relatable. Nadine’s relationship with her teacher Mr Bruner (Woody Harrelson) is wonderful, and it’s also where a lot of the comedy comes from. Her mother (Kyra Sedgwick) has her own problems and is never available for Nadine to talk to or ask for advice so Mr Bruner becomes almost a surrogate parent in her eyes. 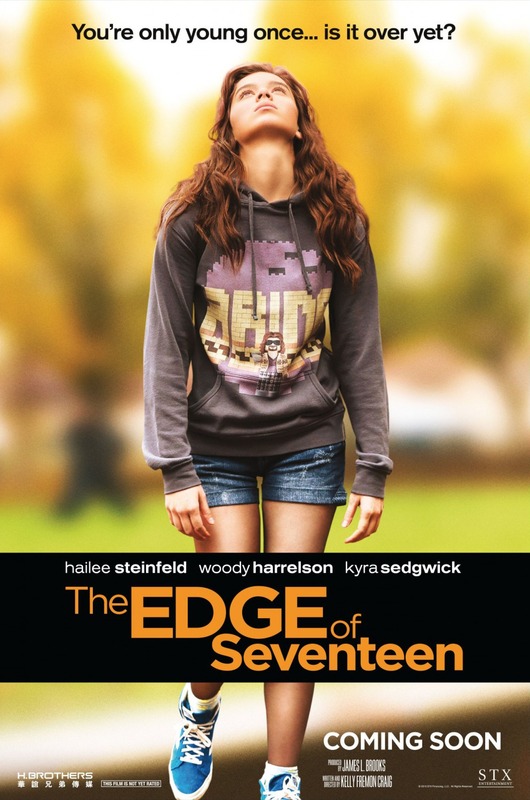 The Edge of Seventeen is a great film. With its clever script, it both embraces and subverts the typical high school clichés. It’s funny and heartfelt and Hailee Steinfeld is brilliant – it’s her performance that gets you to like Nadine even when she’s doing crazy things and pushing people away. 4/5. Enter your email address to follow ElenaSquareEyes and receive notifications of new posts by email.